March 29, 30 and April 4, 5, 6, Losekamp Hall, 7:30 p.m. 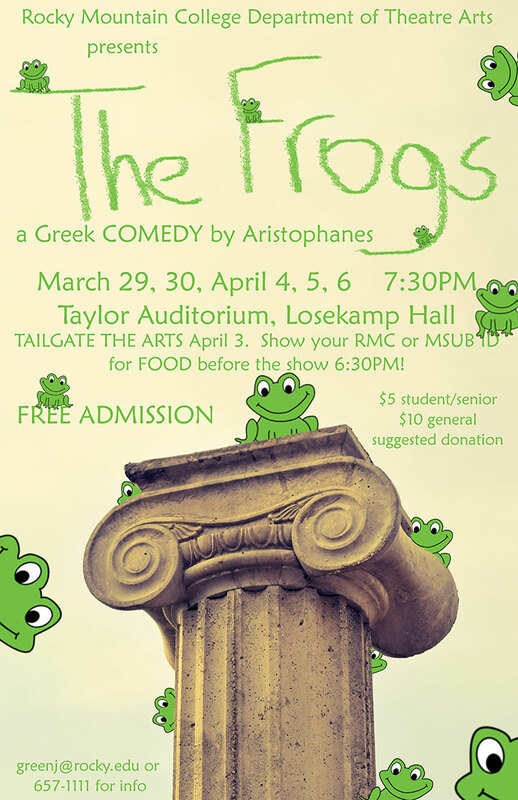 The Rocky Mountain College Department of Theatre Arts presents THE FROGS, a Greek COMEDY written by Aristophanes. The play is one of the great Greek comedies that satirizes and comments on politics and society. The story follows the god Dionysus and slave Xanthias as they travel to Hades to bring back the great playwright Eurpides as Dionysus believes there to be no good poets left in the living world. Their journey takes them to the door of Hercules, through a world of singing frogs, into a ritual of Initiates, and finally into Hades and a battle of wits for the right to return to the living. This adaptation contains bad puns, plenty of jokes, political satire, puppets, Monty Python and Three Stooges influence, some old references and some new references. As was the case for Aristophanes in his time, nothing is sacred!